Amongst the washroom solutions, bench seating and lockers, Oliveti Cubicles also supply a substantial range of furniture, fittings and equipment (FF&E) - For a wide variety of end users but particularly for nurseries, primary schools, secondary schools, colleges, universities and research laboratories as well as office furniture and specially designed storage for the healthcare sector. From cupboard shelves to furniture for an entire school, whatever you're looking for Oliveti have everything to make it happen. Oliveti have long standing partnerships with many suppliers and we are able to offer a comprehensive and economic furniture, fittings and equipment solutions. We also provide these facilities for all other sectors but have a high client base for the sectors mentioned above. Although we provide standard sized storage to give our clients a user-friendly approach when purchasing our storage units, we also have a bespoke service, you pick what you want and what size and we will build it for you! We have a wide range of colours which can be found on our colour collection chart. We are an innovative company and work with our clients to ensure they get exactly what they wanted. Talk to us about your unique ideas and we will work with you from start to finish. Panels are constructed of high performance melamine faced particleboard (MFC). This material has passed BS6250 part 3, laminate performance, tops and bottoms are of 25mm, ends are of 18mm with divisions 15mm and backs 8mm to match. All carcase panels are lipped in high impact resistance 1mm PVC edging to match carcase colour. All fronts are edged in 3mm PVC with rounded edges. Units are doweled, glued and cramped and are available ina choice of colours. Made from a matching 8mm MFC board, backs are removable in all cupboard and udnersink units. In all other units types they are securely fixed in position. Underbench units are supported on four heavy duty adjustable feet. Each unit is supplied with 75mm feet adjustable from 60mm - 90mm and 125mm feet adjustable from 110mm - 145mm. Plinth rails are supplied in continuous lengths of 15mm dark grey (BS 00A13) melamine faced MR board. Sealing strips are provided for wet areas. Availabel as an option to all non-serviced units are two-wheel hooded castors, in metal die-cast units with a load bearing capacity of 56kg each. Castor height is 75mm overall and castors on semi-mobile units have a laod bearing capacity of 60kg each. Sides of epoxy powder coated mild steel in cream (RAL 9001). Bottom and back are of 15mm melamine faced chipboard, lipped on exposed edges with 1mm PVC. Drawers are mounte don soft rollered runners. Normal drawer side depth is 71mm with bottom drawers having 135mm side depth internally. Fronts are 123mm and 169mm respectively. Drawers can be fotted with blum pull out stops as an option. Please ask for details. Underbench cupboard units are fitted with an adjustable shelf. Manufactured from 18mm MFC board lipped in 1mm PVC to front edge, these are supplied to match carcase finish. Shelves are supported on transparent shelf clips with 5mm steel pins. Hetal MB20 Contract quality semi-concealed chrome plated hinges. Hinges are adjustable to 230°, hinges are fitted using euroscrews to ensure strength of fixing and durability. Hinges have integral catches and doors are tested to exceed 45kg loading to top corner. Solid plastic "D" pull 15mm diameter. Finger space 80mm x 24mm, abailable ina choice of colours. Alternative handles are available to customer preference. Made from 18mm MFC lipped all round in 3mm PVC to match carcase. Fronts are available ina choice of colours. LAminate faced MDF fronts are also available as an option. ocks are availabel on request and are fitted as standard to all tall cupboard and wardrobe units. 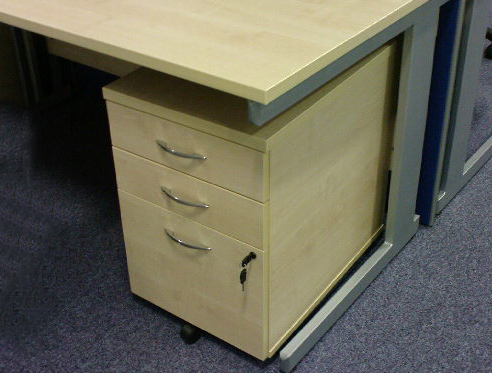 When required locks are fitted to top drawer only on drawer units and both door and drawer. All glass used in our ranges on fronts is 4.5mm toughened safety glass.